For years I made my own greeting cards. I loved making them personal for the intended recipient. Over the past few years I got out of the crafty stage and would only make them on a whim. I now run to big chain store and pick up $5 unpersonalized cards. I dread it every time. Besides the running to the store, I do use online sites to create my own personalized greeting cards. Besides the hand made making of cards, this has to be my second favorite way to make & send cards. I just recently found out about MoonPig (crazy name for sure) and have used them to create cards to send on to others. MoonPig will deliver your card as snail mail!! I feel like I have a personal assistant when I use MoonPig!!! They are out of this world. It is very easy to create a card at Moonpig. Just select your card, make your own personalized changes, preview and order. As I already mentioned, they mail the card to your recipient and include an email copy, too. The company will mail the cards on to you, too. I love that you can personalize the cards with photos. I always try and include my photos with the cards that I personalize. Their photo upload cards are beautiful. The print quality is very clear. It is quick and easy to upload and set into the card design. The quality of the printed card is equal to those in the chain stores. 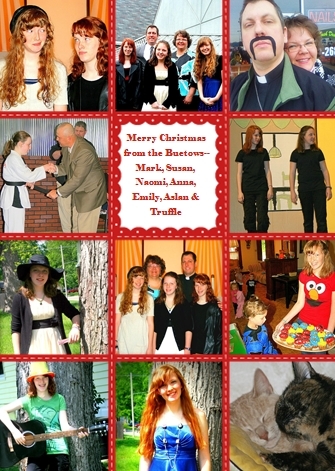 The above card is one that I made as a "year in review" photo Christmas card. Check out Moonpig by clicking any of the above links. The price is right. The quality is over the top and the speed of delivery is quick. You'll find cards for most every occasion. If you hurry you can get them to mail out some Thanksgiving cards for you. Thanks to Jennifer over at Mom Blogger Club for including me in on the review opportunity. I was compensated to try out the company and make my own cards. This is my own tasty opinion.